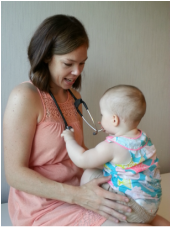 Laura's passion for the environment, global health, and maternal and newborn care led her down her path to become a Naturopathic Doctor and International Board Certified Lactation Consultant (IBCLC). After completing a Bachelors degree in psychology, she went on study Naturopathic Medicine at the Canadian College of Naturopathic Medicine (CCNM) in Toronto. It was during that time she was introduced to Dr. Jack Newman's International Breastfeeding Centre and the amazing work they do to help families achieve their breastfeeding goals. Realizing Lactation medicine was the missing piece she was looking for in her training and understanding the value of qualified lactation support, she decided to enroll and complete the necessary steps to become an IBCLC. Laura sees herself as a community mobilizer and humanitarian. The clinical focus in her private practice is with women in the postpartum period, supporting their transition into motherhood, guiding them with feeding support, and promoting infant mental health. She has worked in Thailand as a private consultant and with the Bangkok Child Protection project, a UNHCR funded initiative through Jesuit Refugee Services, where she provided case work support and health education to unaccompanied minors. Laura currently calls Toronto home where she lives with her husband and their two young children.